"Send your men of science quick!" "They're here already!" shouts a crazed man, running onto the night-drenched highway outside of Santa Mira, California. "You're next! You're next! You're next!" he screams to anyone who will listen, as he jumps onto the fronts of cars and trucks, bangs on drivers' doors, and pulls at his dirty, unkempt hair. This is Dr. Miles Bennell, and he is the lone surviving witness of an alien invasion that threatens to overtake the entire world. Taken under emergency psychiatric care, he tells an elaborate, unbelievable story of people who are not who they are, of bodies being snatched and replaced by men and women without humanity, and of giant seed pods from outer space. 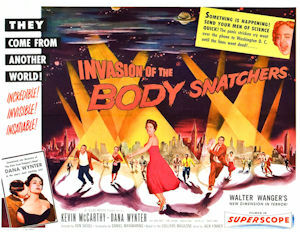 Rushed through principle photography in under four weeks on a budget of less than $400,000, starring relative unknowns (at the time), and plagued by studio interference, it's remarkable 1956's Invasion of the Body Snatchers is half as good as it is. Nevertheless, it is a fondly remembered classic of science-fiction/horror, serving as a template for the multiple remakes that would follow. Created by Don Seigel and Walter Wanger and written by Daniel Mainwaring, it is a direct adaptation of Finney's popular serial, The Body Snatchers (which we covered last week), with multiple scenes and lines of dialogue ripped directly from the page. However, with some notable omissions and a drastically changed ending, it feels more like a Cliff's Notes version of the tale, breezing through important scenes and cluttering a lot of events into a bare few. I understand film adaptations have to cut certain things, and that's not what I'm complaining about here. The novel isn't particularly long, and some of the missing details affect certain plot beats in a negative way. For example, early in the story, Miles' friend Jack finds a strange body in his house's basement, but in the movie, he doesn't tell Miles where he found it until much later. Afterward, as Miles is driving Becky (the female lead) to her home where she lives with her father, she fails to mention to him that she has begun to suspect her father, which is something she does in the novel. In the novel, Miles' subsequent deductive leap into concluding that Becky is in danger and that he must break into her basement to look for a duplicate makes sense, but in the movie, where Miles doesn't know to look in the basement or suspect Becky's father, it really doesn't. Despite damaging shortcuts like this, though, the film is still remarkably faithful to the source material, and in some places, the script finds clever ways to address the novel's greatest weaknesses. In the movie, both Miles and Becky are fresh from returning to town after an absence, so Santa Mira's transformation isn't as seemingly abrupt; here, it feels like a realization slowly dawning on the protagonists that this isn't the same town they remember. Additionally, the ghost town qualities of the book (closed shop-fronts, roads falling apart, salesmen choosing to avoid the town because it's no longer profitable, etc.) aren't shown, so the transformation isn't as extreme. There's also a few new and minor details that flesh things out. When Miles and Becky first meet up with Jack and his wife, Teddy, to discuss the body Jack has found, Jack cuts his hand badly enough to bleed profusely, something that doesn't happen in the novel. Then, later, after Miles and Becky have left and Jack has fallen asleep, Teddy sees the body develop a bleeding cut on its own hand, which is what causes her to freak out, wake Jack up, and flee to Miles'. In the novel, it is never explicitly stated what Teddy saw--it is implied that the body just started to look more like Jack--but this small detail makes it more visual, understandable, and satisfying (so much so that it would be copied in the next adaptation with a nosebleed). These changes become larger as the movie gets closer to its conclusion. Sticking with Jack, for instance, he is turned into a pod person in the film, something that doesn't happen in the novel. In the novel, Jack and Teddy exit the story about two-thirds of the way through and only show up for a brief cameo of sorts as they are chased around town by the aliens. They have no impact on the climax or denouement. But in the movie, when the aliens corner and confront our heroes at the climax, Jack is among them, and this adds a wonderful layer of horror and emotional impact. Which brings me to the ending, where the book and movie deviate almost entirely, and where the studio interference is most pronounced. No doubt the most surprising twist comes when Becky herself is turned, and I'm genuinely torn about how to feel about this. On one hand, it solves the problems the book had with her being little more than set dressing for the final moments, but on the other, it completely upends the theme of two divorced people learning to love and trust again by ensuring that, no, Miles will never be able to do that. I can accept this if I keep in mind two things: (1) a bleak ending makes more sense for the story and the genre; and (2) this movie's theme is a bit different than the book's. Unfortunately, the aforementioned studio interference undoes some of that first point, by shoehorning-in a quasi-happy ending that wasn't originally shot or scripted. In the first cut of the film, it ended with Miles shouting uselessly at the cars and trucks on the highway. It's a little ambiguous, but heavily implies that there is nothing Miles can do to stop the invasion, that this will end with the world overtaken by the pods. Test audiences even approved of this, but the studio refused to release a film with such a downer ending, and so a framing sequence was filmed and slapped onto the beginning and end of the movie, in which Miles is questioned and is able to ultimately convince the military to move in and contain the invasion in Santa Mira. Needless to say, I disagree with the studio and feel the original ending would have been far superior. This isn't to say I disagree with every decision the studio made. Reportedly, the original cut also had a good deal of humor thrown into the mix, and the studio demanded that most of it be cut. It's hard to know for sure without actually seeing what was cut (which was probably lost long, long ago), but this feels like the right call, given how the tone of the finished film works just fine. Indeed, Kevin McCarthy's performance as Miles is still full of a kind of homey playfulness that endears him to the audience, especially early on, and I think if he maintained a jokey, humorous attitude as things ramped up, it might have clashed with the more somber overtones of the story. But while we're on the subject of McCarthy, who is brilliant, I never buy his relationship with the female lead, Becky, played by Dana Wynter. No offense to Wynter, who is also quite good in the role, but the two just don't have the right chemistry; their budding romance doesn't click the way it does in the novel. Instead, it feels a lot more cliché and contrived, as though forced into the story because every story needs a romance. This isn't helped by the fact that the movie is more concerned with themes of individuality versus conformity than with love conquering doubt. While still relatively apolitical from a literal viewing, it's understandable that a lot of people would walk away thinking this is a movie about communism and/or McCarthyism, because this movie is definitely about extreme social pressure to assimilate. The filmmakers deny they had any intentions to make a political point--almost as vehemently as Finney denies it about his own book--but you can't say politics are totally absent from the subtext. 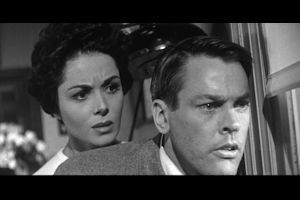 Ultimately, though, and taken on its own merits, 1956's Invasion of the Body Snatchers is a creepy, unsettling little film that stands apart from most of the sci-fi/horror schlock of the era. It might have worked better if it underplayed the hokey sci-fi even more by omitting the third act exposition dump that explains where the pods came from and what they intend to do, but if the studio objected to the ambiguity before, they'd have certainly vetoed any additional obfuscation. As an adaptation, it's a bit of a mixed bag. The book says more about the human condition, but the movie fixes almost all of the book's flaws, despite rushing past critical details. On top of that, the movie is a more consistent horror story, and the scene of Miles shouting, "You're next! You're next! You're next!" has been permanently etched into the history of Hollywood. I'm not ashamed to say I love this flick, maybe even more than I do the novel. Then again, it's not actually my favorite adaptation of Finney's work, so you'll have to come back next week to find out where the 1978 version ranks.